Product code: ES2336 Categories: Sold Items, Sold Jewellery, Sold Watches. 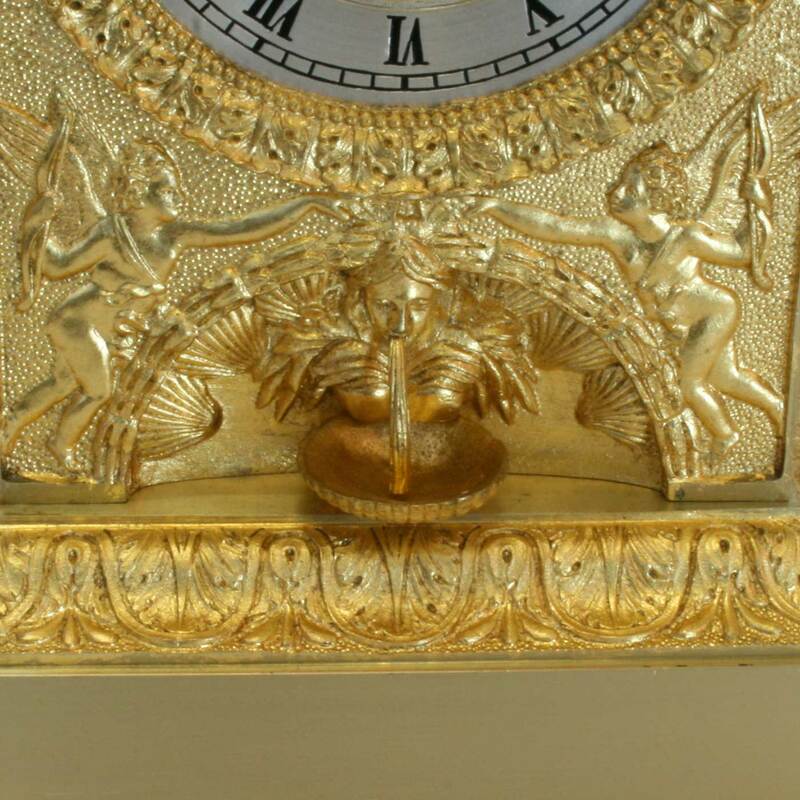 The French always knew how to make the most magnificent clocks fitted in cases that are captivating and so stunningly beautiful as is this antique French time and strike clock made in the early 19th century. 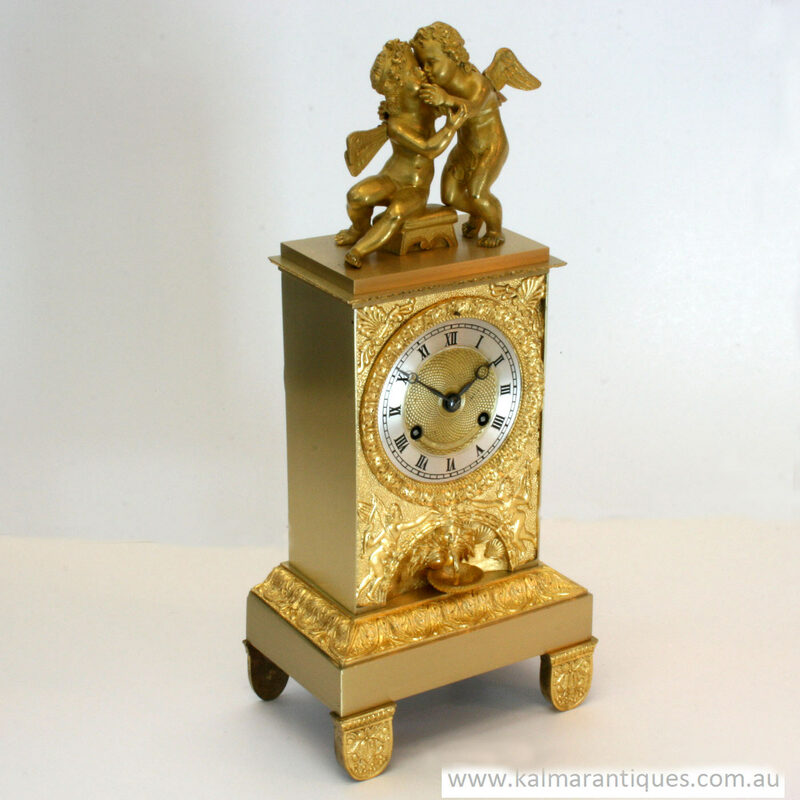 Made in the 1840’s the clock case is all gilded and has such an amazing colour that will stand out in any room of the house and looks especially attractive on a mantle shelf. Made with ancient Romanesque scenes on both the top and the fine detail at the base, this is an antique clock of such fine quality and is a real testament to what could be created all those years ago. Inside is a 8 day silk suspension time and strike movement that has undergone a complete overhaul and runs perfectly and chimes on the hour and half hour and comes with our 1 year warranty and was made by the French clock maker Bechot and was retailed by the French retailer Gillion in the 1840’s. The silver dial is spotless and clean with black Roman numerals and so easy to read and adds so much charm to this already magnificent clock. Measuring 36cm high by 16cm wide by 10cm deep, this antique clock is magnificent from all angles and is a true masterpiece. We can organize shipping of this clock both interstate and overseas with price of this upon request.